It’s Thursday, so that must mean it’s time to talk about the good stuff that’s been going on in the last week! 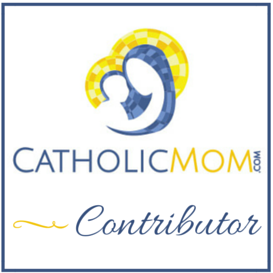 Be sure to check out all of the Small Success posts at CatholicMom.com today, and share your successes in the comments here or on your own blog. It seems that all of my successes this week have to do with reducing stress in my life. I’ve had various things that have been stressing me out, some of which would keep me up in the night with worry and mini-anxiety attacks. While I know other moms who can do more than me, I have to keep in mind my own temperament and work to not overload myself. (Remember The Grace of No?) I’ve been working at cutting out things that have become too much for me and adjusting my other activities so that I can be a better wife and mother. Having less stress in my life makes me a better wife and mother because I’m far less likely to kill to scream at to take my frustrations out on my family. Since making that huge homeschooling decision last week, my stress levels are coming way down. We’ve looked at the courses that my older daughter will need her senior year and worked backwards from there, figuring out what courses she’ll have to complete next year to set herself up for a great and stress-free (or as stress-free as possible) senior year. We’ve talked about taking one or two or her senior courses at the co-op in the fall, and that might be possible, too. She’ll even finish at least one of her junior courses before summer starts! Even though I’m still getting some feedback from other moms that it’s possible to finish, we’re decided:we’re taking that extra year, and we’re graduating with some sanity. I found a way to get my kids to important soccer and dance activities on the day that our god-daughter is receiving her First Holy Communion in northern Virginia. I’ve been stressed out about how to manage this, and finally got the last pieces figured out this week. The day of First Communion, my older daughter’s soccer team will be playing in the regional playoffs for soccer (in hopes of going to the state playoffs again). This is happening more than an hour away from our home. At the exact same time, my younger daughter has a mandatory dance rehearsal because her recital is the following weekend. Thios rehearsal is in our town. Since I haven’t figured out how to bilocate, I was really stuck when it came to tri-location. So I sucked it up and begged for help. Actually, I just asked, and other parents came through, offering to take our girls overnight and get them to their activities. We’ll be driving up and back on the Big Day, getting back by dinner time so that we can get our girls back. Thank God for generous people! I finished the year for Sunday school. Once I got into the teaching year, I realized just how stressed it was going to make me. Once upon a time I felt very called to be a catechist. That is not true for me today, and I’ve been moving towards more writing, which is hard to do consistently when you don’t make room for it first. Even though I wasn’t on to teach each week (we have four catechists to teach the middle school kids, all in one class), there was still this level of stress that was involved with going every week. And stupid introvert me, I let that affect me too much. I’m kind of looking forward to more relaxing Sunday mornings next year, and to making more time to write (and blog) more consistently. So how about you? Tell me about your successes this week! What’s gone right for you in life lately? Awesome. It is amazing what stress can do to a person. I spent 6 weeks at a job that gave me panic attacks and the manager approached the contract team with the manner of a drill Sargent. I was so happy when another opportunity came up and into my second week I feel much better. I read about your decision to chill out with your daughter’s last year of schooling! Good for you two. If you can figure out how to bilocate (apparently I’m not a saint yet), let me know. I understand the stress of needing to be in a million places at once. It’s so hard for me to just ask for help! Others are always willing! Glad you got it all worked out. You KNOW I know all about what stress can do to a person. I’m so happy that you were able to got some things off your plate.